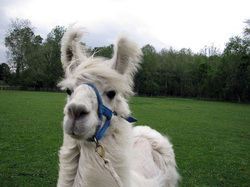 We'd love to have you check out the yarn, llama roving, llama/sheep blended roving, llama batts/felted batts and horse tail and mane hair in our Etsy shop, heartsongllamas. We have our fleeces processed at these two wonderful mills, Spinderella's Fiber Mill and Mystic Water Fiber Mill. Tip! If you'd like to find a discount coupon code to use in our Etsy shop, check out Vickie's Twitter feed @vickiemaris where she typically lists a coupon on a daily basis. Feel free to retweet the coupon to share it with your friends so they can get the discount too! 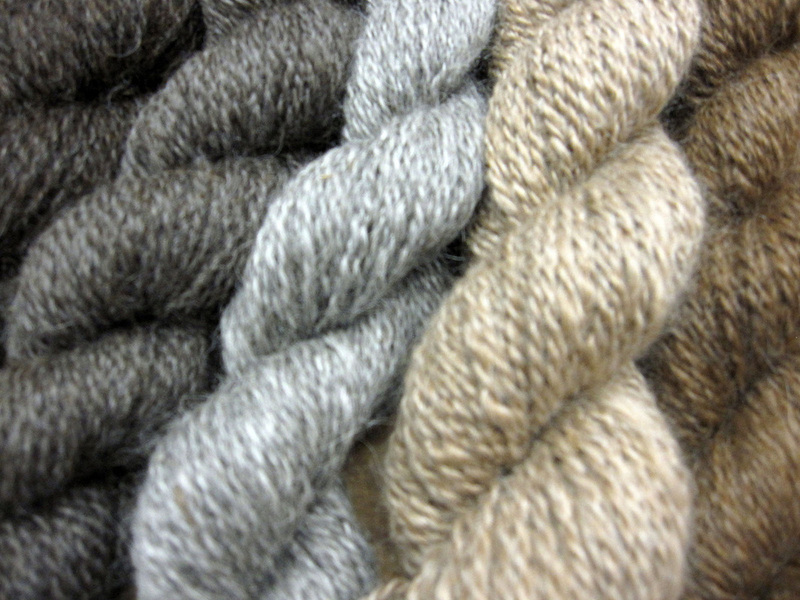 Worsted 100% llama yarn from several of our lovely llama fiber producers! From left to right: SVL Llovely Llana, LUA Holiday Status, DDH's Gisele, Hard Rock's Silver Fortune + Hard Rock's Primary Colors, and LUA's Bravado's Cierra. 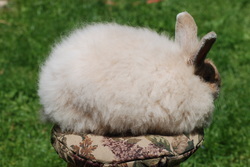 We harvest the lovely fluff of our French Angora rabbits about every three to four months. The rabbit begins to shed which is the signal that it is time to pluck or shear their coat. They enjoy the grooming and we sure enjoy using their fluff. It is available in our Etsy store. We also sell pedigreed French Angoras and Polish rabbits. Visit www.heartsongrabbitry.com. 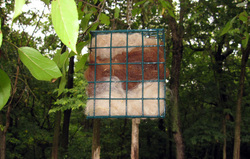 Felting Fiber and Spinning Workshops at St. Mary-of-the-Woods College in Indiana. There is a major fiber festival in Greencastle, Indiana each year in April. Here is a link if you're interested in attending. I attended in 2012 and was pleasantly overwhelmed with all of the fiber, fleeces, yarn, spindles, spinning wheels, rabbits and fiber tools on display, and for sale! You should attend. 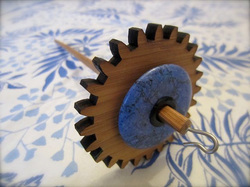 Vickie has learned to spin on a spinning wheel and is also learning to use the drop spindle. Her first two spindles are: a Turkish drop spindle in beautiful tiger rosewood from Jim Carlson Designs (photo is coming) and a top whorl spindle by DawningDreams. The photo at left is from DawningDreams Etsy listing for the spindle. Both spindles are fun to spin with and very beautiful to admire! 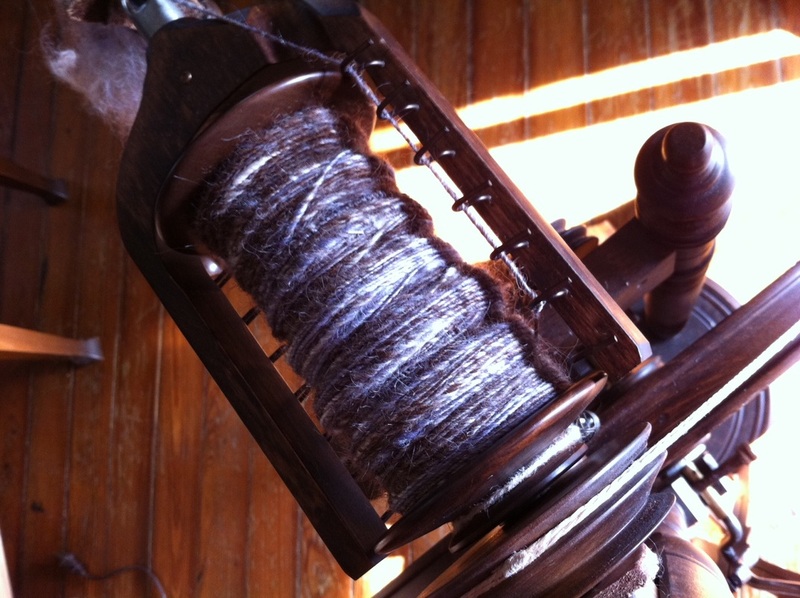 If you'd like a portable way to do spinning, consider the ancient method of drop spindling. 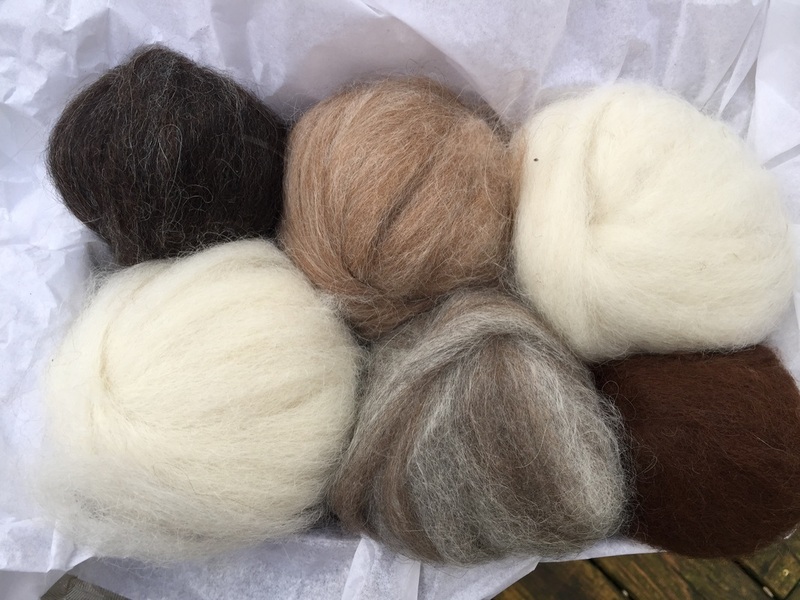 Spinning fiber is a great way to de-stress from work and to get to learn more about the fiber that your animals are growing. Vickie enjoys working with the llama and angora fiber and also is learning to hand card fibers for beautiful blended rovings to spin. Click on the title above to see a video on Youtube by www.artofmegan.com that shows how to ply yarn singles that you've created on your drop spindle into a two-ply yarn. She shows how to make an Andean bracelet and a double wrap ball of yarn. These two steps allow you to even out your yarn into two singles of equal length so you don't have any waste when you're done plying. Going from the Andean bracelet to the double wrap ball of yarn allows you to set your project down and walk away without things getting tangled. It's a helpful video with things well explained. Vickie's project in Tour de Fleece 2012. She hand-carded a lavender-dyed blend of coopworth/milk fiber with llama rovings from LUA Annabell Status and with Angora rabbit fiber from Fluffington Farm's Louie. She showed this yarn at the North American International Livestock Expo (NAILE) llama show and then later sold it to a knitter. In the photo, you see it on the bobbin of the Kromski Minstrel spinning wheel.